Sponsored by the WSUU Common Quest Adult Education Team The WSUU Common Quest Committee invites all youth and adults to join us for Part II of an important three-part series on where our faith is headed at the national and local levels, with respect to racial justice. 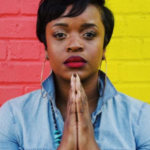 In Part II, we will screen a powerful 50-minute presentation of the Annual UUA General Assembly Ware Lecture given this year by Ms. Brittany Packnett on racial justice, then discuss her message. Previous Ware Addresses have been given by Dr. Martin Luther King Jr., Norman Lear, politician Shirley Chisholm, Kurt Vonnegut, Cornel West, and poet Mary Oliver. For more on the Ware Lecture Tradition, see: https://www.uua.org/ga/program/highlights/ware-lecture [If you are unable to attend the screening, we highly recommend watching the lecture online at https://www.uua.org/ga/off-site/2018/ware. The full text of the address may be accessed by clicking on “Unedited live captions (TXT)” near the bottom of the page. Only a brief excerpt appears in the Fall 2018 UUWorld.] About Ms. Packnett: Brittany Packnett is a leader at the intersection of culture and justice. She serves as Teach For America’s Vice President of National Community Alliances, where she leads partnerships and civil rights work with communities of color. Beyond Teach For America, Brittany was a Ferguson protester and continues in activism as, among other things, co-founder of Campaign Zero, a policy platform to end police violence. She is a contributor to the Crooked Media network, most notably contributing to the weekly news roundup on Pod Save The People. She is a Video Columnist for Mic News, and writes for many publications. Read more about Ms. Packnett at https://brittanypacknett.com/bio/. Sponsor: Common Quest Adult Education Team Contact: Cecelia Hayes, BettyDrpr@gmail.com Day/Date(s): Saturday, November 17 Time: 7-9:00 p.m. Location: Social Hall Class Limit: None Registration Deadline: Please register by Thursday, November 15, for food planning purposes. Please email commonquest@wsuu.org by Thursday, November 8, if you desire CHILD CARE. If we have enough interest, we will make arrangements. The WSUU Common Quest Committee invites all youth and adults to join us for Part II of an important three-part series on where our faith is headed at the national and local levels, with respect to racial justice. About Ms. Packnett: Brittany Packnett is a leader at the intersection of culture and justice. She serves as Teach For America’s Vice President of National Community Alliances, where she leads partnerships and civil rights work with communities of color. Beyond Teach For America, Brittany was a Ferguson protester and continues in activism as, among other things, co-founder of Campaign Zero, a policy platform to end police violence. She is a contributor to the Crooked Media network, most notably contributing to the weekly news roundup on Pod Save The People. She is a Video Columnist for Mic News, and writes for many publications. Read more about Ms. Packnett at https://brittanypacknett.com/bio/. Registration Deadline: Please register by Thursday, November 15, for food planning purposes. Please email commonquest@wsuu.org by Thursday, November 8, if you desire CHILD CARE. If we have enough interest, we will make arrangements.